As you walk through the tiny streets of Sualkuchi, you will mostly hear the rhythmic clicking and clacking of looms and throw-shuttles that are used for weaving. What’s appealing about this village is the sight of the local women and men working on the looms and the magnificent product that is created at the end. The periodic movement of their hands and legs on the looms, which turns silk threads into splendid fabrics with gorgeous woven motifs, demonstrates the artisans’ inimitable skills. While weaving comes naturally to the natives of this village, it is more than just a tradition that’s handed down the generations – it’s their way of life! Situated on the bank of the mighty river Brahmaputra, 30 km from Guwahati in Assam, this picturesque village is a haven for silk fabrics, like Muga, Pat, and Eri, and is widely known as silk-haven, Manchester of the East, and Manchester of Assam. 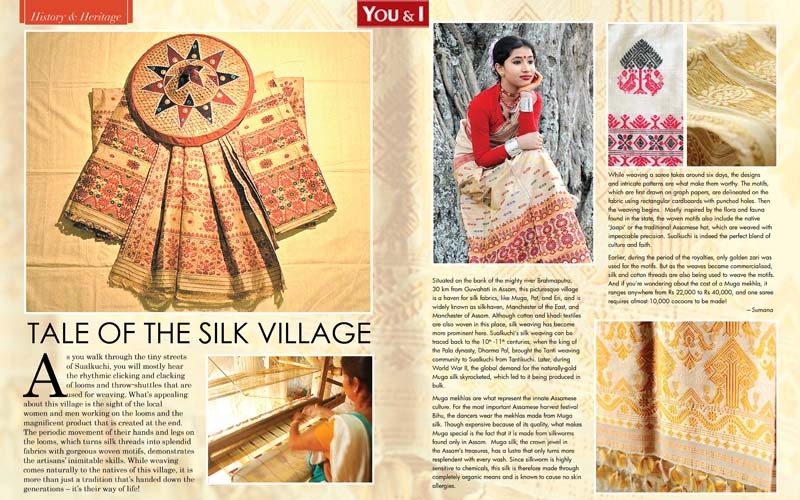 Although cotton and khadi textiles are also woven in this place, silk weaving has become more prominent here. Sualkuchi’s silk weaving can be traced back to the 10th -11th centuries, when the king of the Pala dynasty, Dharma Pal, brought the Tanti weaving community to Sualkuchi from Tantikuchi. Later, during World War II, the global demand for the naturally-gold Muga silk skyrocketed, which led to it being produced in bulk. Muga mekhlas are what represent the innate Assamese culture. For the most important Assamese harvest festival Bihu, the dancers wear the mekhlas made from Muga silk. Though expensive because of its quality, what makes Muga special is the fact that it is made from silkworms found only in Assam. Muga silk, the crown jewel in the Assam’s treasures, has a lustre that only turns more resplendent with every wash. Since silkworm is highly sensitive to chemicals, this silk is therefore made through completely organic means and is known to cause no skin allergies. While weaving a saree takes around six days, the designs and intricate patterns are what make them worthy. The motifs, which are first drawn on graph papers, are delineated on the fabric using rectangular cardboards with punched holes. Then the weaving begins. Mostly inspired by the flora and fauna found in the state, the woven motifs also include the native ‘Jaapi’ or the traditional Assamese hat, which are weaved with impeccable precision. Sualkuchi is indeed the perfect blend of culture and faith. Earlier, during the period of the royalties, only golden zari was used for the motifs. But as the weaves became commercialised, silk and cotton threads are also being used to weave the motifs. And if you’re wondering about the cost of a Muga mekhla, it ranges anywhere from Rs 22,000 to Rs 40,000, and one saree requires almost 10,000 cocoons to be made!